Henry Gilbert Greybrook was born in Crookston, Minnesota on August 20, 1925. 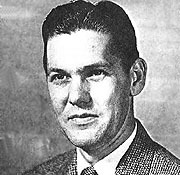 He received his formal education from the University of North Dakota and during WWII, served in the Navy (1944-46). After the war, Greybrook moved west and took a job with Portland, Oregon architect Clarence Wick (1952). He then went to work as a draftsman and designer for the firm of Roald, Schmeer & Harrington (1952-55) also in Portland. After stints with architect H.B. Boone (1955) and Holman J. Barnes (1956-59) both in Portland, Greybrook moved to Vancouver in 1959 and took a job with architect Day W. Hilborn. He received his WA State architectural license (No.1000) on June 20, 1957 while working for Barnes. In 1961 Greybrook opened his own office in Portland, sharing space with architect Henry J. Vodeberg. Known projects include Hazel Dell Lanes Bowling Alley (1960) in Vancouver; and a Medical-Dental Building (1961) in Portland. In 1965 he formed a partnership with fellow architect Keith Bradbury in Vancouver. Together Greybrook & Bradbury produced several projects at Clark College; the Westmoreland Manor (1965) in Portland; Ya Po Ah retirement Apartments (1966) in Eugene; and the Reynolds Metals Office Complex (1967) in Longview. Their most notable project is the cylindrical curtain-walled Smith Tower (1966) in Vancouver. The building used a lift-slab technique based around its central core, akin to Chicago’s similarly-corncob-esque Marina City. In 1970 Greybrook and Bradbury parted ways, each opening independent offices. Projects by Geybrook during this later period are unknown at this time. Greybrook passed away in Vancouver on August 29, 1976 at the age of 50. An apparent suicide, Greybrook was wrapped up in a scandal involving alleged financial irregularities in connection with the construction and management of the Portland Labor Temple project, a building which he had designed. WA State Architectural License - Feb 9, 1952. AIA Historical Directory - 1962, 1970. "City's Tallest: Building of Apartment House for Retired to Start in a Month" Eugene-Register Guard, March 30, 1966. "Multnomah DA ending probe of labor center" Eugene-Register Guard, September 9, 1976. "Report connects defunct firm, labor leaders" Eugene-Register Guard, August 30, 1977.